In this poignant, hilarious and deeply intimate call to arms, Hollywood's most powerful woman, the mega-talented creator of Grey's Anatomy and Scandal and executive producer of How to Get Away with Murder, reveals how saying YES changed her life - and how it can change yours too. With three hit shows on television and three children at home, Shonda Rhimes had lots of good reasons to say no when invitations arrived. Hollywood party? No. Speaking engagement? No. Media appearances? No. And to an introvert like Shonda, who describes herself as 'hugging the walls' at social events and experiencing panic attacks before press interviews, there was a particular benefit to saying no: nothing new to fear. Then came Thanksgiving 2013, when Shonda's sister Delorse muttered six little words at her: You never say yes to anything. 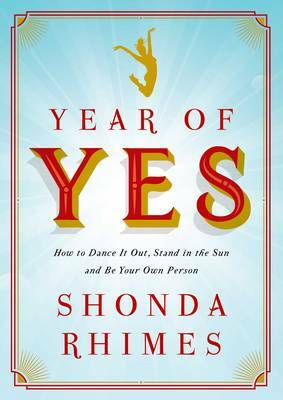 Profound, impassioned and laugh-out-loud funny, in Year of Yes Shonda Rhimes reveals how saying YES changed - and saved - her life. And inspires readers everywhere to change their own lives with one little word: Yes.